Jubilee is a simple Czech counting game for two to seven players. 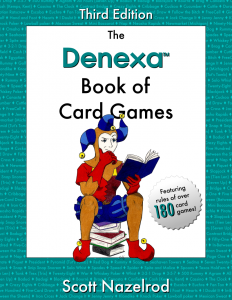 Players use cards from their hand to add to or subtract from a running total. If they can manage to make the total an exact multiple of 25, they score points. If they overshoot too far, though, they get slapped with a penalty! The object of Jubilee is to score the most points by making the running point total a number divisible by 25 as many times as possible. Jubilee uses a unique 61-card deck. 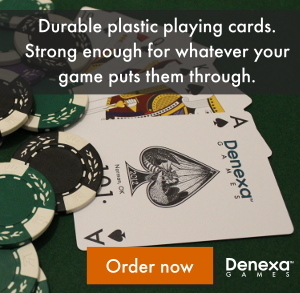 Starting with two decks of Denexa 100% Plastic Playing Cards (with all four jokers), discard all the diamonds, as well as the hearts from one deck, and both copies of 10-J-Q-K♣. You’ll be left with a deck composed of A–K♥, A–9♣ (×2), A–K♠ (×2), ★ (×4). You also need something to keep score with, like pencil and paper. Shuffle and deal eight cards to each player. Place the rest face down in the center of the table, forming the stock. Each card in Jubilee has a numerical value. Aces are worth the most, at fifteen. Face cards are worth ten. Jokers are worth zero. All other cards are their face value. These values are positive in clubs and spades, but negative in hearts. The player to the dealer’s left plays one black card from their hand, face up, and states its point value, then draws a card. The next player also plays a card, adding its value to that of the card before, stating the new running point total, and draws a card to end their turn. The only restriction on play is that the point total cannot drop below zero. If a player only has hearts that would cause the total to become negative, they show their hand to the other players and skip their turn until they can play.